One of the new features on the Fuji X-T1 is the ability to tether the camera to a smartphone or tablet device via WiFi. Initially I figured this was somewhat of a gimmick for the FaceBook generation, so that they could quickly upload their selfies, which indeed they can. But after I’d downloaded the App from the Apple App Store – and installed it on an iPad Mini, I came to a different conclusion. This is actually rather useful! For today I’m going to focus on the Remote Control features. The camera can be configured to have a custom name (SSID), I quickly edited mine to add my initials. It shows up on channel 10 – no idea if this varies at all from time to time or model to model, I’ll test more as time goes on. WIth the X-T1 transmitting WiFI, you then go to your WiFi enabled device, and look for the X-T1 WiFi SSID – when you see it, you connect your device as if you’re joining that WiFi network. The first time you connect with a smart device, the camera asks if you accept that connection – this prevents unknown users from taking over your X-T1! You do not need any other WiFi network (WLAN) in place to make this work. You can be in the middle of nowhere, and it’ll work perfectly. You are in effect building a two device WLAN, with the camera and your smart device. The two devices are now paired, and the App displays a live picture from the X-T1, along with all the settings currently in place. The image is live, i.e. real time – so you can see movement on your remote device, and should be able to trigger the camera to capture something that’s moving in front of the camera. The image display is also showing the film style chosen – so if you selected B&W, you’d see the B&W image on the remote device in real time – so it behaves just like the EVF/LCD. You don’t get all of the HUD info from the camera – no focus distance, horizon etc etc Not sure how much of that would be relevant to tethered shooting? There’s also a menu to the side of the shutter release, which allows you to change the settings on the camera remotely. So you can override the camera’s settings for ISO, Film Sim, WB, Macro, Self Timer. On the main screen you can adjust aperture remotely, trigger video recording, and also go to a playback screen to review the images stored on the camera’s SD card. You can retrieve these images to your device over WiFI – I think only JPEG versions, but I have yet to RTFM! As it was rather chilly this morning, at least for California, I decided the new feature would due put to good use. 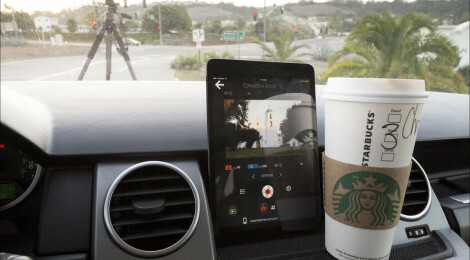 I set up my camera on it’s tripod, ready to shoot sunrise at the Mission – and then paired it with my iPad Mini. I then retreated to the warmth of my car, to sip on my coffee, and wait for the sun to come up. I could control the camera, see what it could see, and take shots, all without having to go back outside. I could also select the point of focus for the camera, simply my pointing at the image on my iPad – the camera focus square moved to cover where ever I pointed, and the camera refocussed. When I saw that the light was right, I grabbed my shot – the camera triggered as soon as the remote shutter release button was pressed. I then decided I’d like to try a mono version with red filter, so selected that via the iPad, and took another shot. At all times I could see what the camera was seeing – so I was able to flick through the Orange, Red, and Green filters in Mono mode, and see the effect, before selecting which one I wanted to use. When I was done shooting – I disconnected from the remote control App, and the camera went into sleep mode. I can see this being useful in the studio, for tethered shooting with live image preview and also image retrieval over WiFi. I could see in really harsh conditions that remote tethering would due a huge bonus, keeping the shooter warm and dry. Also in the field for nature photography, where the camera is remote controlled from a hide in order to get the camera closer to the subject without direct human presence. Also in sports, where you could put the camera in ‘harms way’, perhaps trackside, or behind a soccer goal, and not only trigger it, but remote control it’s settings, and retrieve files for upload to the media – before the event has even ended. I’m sure people will come up with other inventive ways to use this new feature on the X-Series, and I’m looking forward to continued App development fro Fuji, or perhaps third parties, if Fuji release an SDK for the interface. The remote app is available for iOS and Android devices at this time, and is free to download. Real time image refresh on the remote device within 10ft from the camera. Outside of 10ft, the frame rate drops as you move further away and stops refreshing/working past approx 30ft. This may vary by smart device, local conditions, RF interference, building proximity etc etc. When the X-T1 is set to BULB mode, the Remote App sets itself to 30 sec exposure, and allows you to adjust both exposure time and aperture, but DOES NOT allow BULB mode to be used from the Remote App. So this will not help astro photographers. There may be an issue here with maintaining a ‘shutter press’ in BULB mode via WiFi – i.e. having the camera know when you pressed the remote shutter is one thing, but having it then continue to keep the shutter open until you release it would suggest additional or even continuous communication between smart device and camera. I’m sure that’s all solvable – but folks will have to request updates for this from FujiFilm. Thanks for the quick review. Now it makes me wonder how much battery power having this feature on for an extended period of time. Might need to figure out how to provide external power. I’m beginning to wonder how this feature will compare with the WiFi capability of the Olympus E-M1. I just tried it and found it too was very useful for remote shooting and for transferring selected images from the camera. However, I wasn’t as thrilled with the GeoTagging feature — sucked my smartphone’s battery dry. It’ll be interesting to see how Fuji’s app compares in these areas. Well, I had it on for half an hour this morning, having shot 200 frames yesterday with the she battery, and it went down one segment by the end of all that. Thank you for the quick reply Chris. Your look at the remote features is the most extensive I’ve seen so far on the net. On my side of the world, we’re going to get our X-T1s after one more week. The GAS will be hard to keep at bay when that happens. By the way, is a feature like this possible to incorporate on the X-E2 via future firmware update? Keep up the great blog. Thanks for the review. It has answered a lot of questions for me. I am very interested in your comment about updates of the App for the X-E2. Where was this stated?? What about the lag between the real world and what the remote sees? You mentioned sports, wildlife etc, are you therefore saying that there is zero lag? I wouldn’t believe that for a second. Every camera manufacturer has this issue, I know my Sony a7R does and I suspect the X-T1/X-E2 function is the same. Can this be used with any tablet or just the Ipad? Hope your coffee was hot!! Any iOS (Apple) device with WiFi, and also and Android device with WiFi I believe. I wonder what maximum distance is, I know like a cell phone it will kill a battery faster I think. Just like wifi it drops fast everywhere. Thanks. There isn’t a fuji app for the lap top as far as I can find, I have the X E2 and want it for that. Have the app on the I phone. Can you tether this to a Mac Power Book and basically do the same thing as with the iPad? Can you at least stream images to your Mac Power Book?? But I don’t see any description of an App for remote control from a Laptop! I enjoyed the article. The Fuji X-T1 seems like a very capable device. I hope to get my hands on one soon. One quibble. Tethering implies a physical connection between two things. 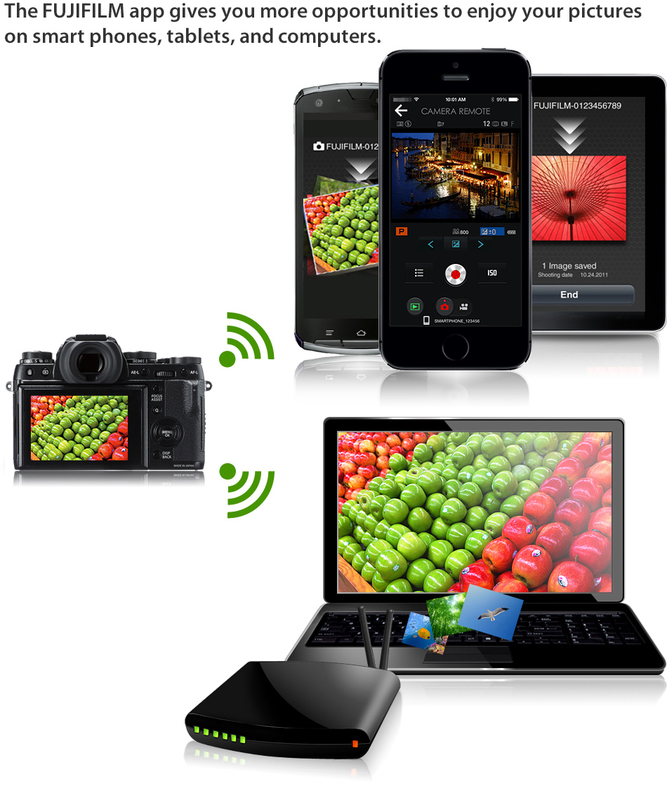 What your are doing here is using the the x-t1 as a wireless access point and connection your phone to it. Just like you would do at home or in a coffee shot. Thanks Khürt – My view is, it’s different – because the AP in a WLAN is transparent to the user, but here we are connecting to the camera and then remote controlling it via that connection. so…. if i wanted to simultaneously trigger two camera bodies side-by-side, can i do that with this app ?? ?